Today we will be exploring something new here at Finance Clever: a real life case study on rental real estate. Thanks to my friend David for encouraging me to write this post and sharing all of his real estate information with me. Over the past several weeks, I have been digging through David’s tax returns, asking follow up questions, and crunching numbers to evaluate the performance of his rental properties. Before we dig into the numbers, here are a few words from David himself to put some context around this case study. “My name is David and I purchased my first rental property in 2011 in my hometown of Warner Robins, GA. This was before knowing about the 1% rule or much of the other guiding principles of wise real estate investing so readily available on the internet now from sites like Bigger Pockets, Coach Carson, and Afford Anything. Since then, I’ve purchased 5 more rental properties in the same area, none of which were purchased according to the strictest of criteria. Six properties are now providing some income every month and my intention is to add 2-3 more in the next two years. Over the last few years, I’ve become involved in the Financial Independence community. I adhere to, and advocate for, many of the critical concepts the Financial Independence endorsed by the community. I’ve been to a handful of CampFI events and founded Fiology because I believe the message of Financial Independence is worth sharing. At events, in online forums, and on social media, I encourage others to consider adding rental properties to their portfolio. I’ve been giving this advice without even knowing how my own holdings have performed between 2011 and today (2018). That’s right, I have never, not once, ever calculated my return on investment. I found myself thinking about all those conversations I had about real estate. The impression I gave was that I knew what I was doing. But what if my actual performance proved otherwise? I needed to determine if I was basing my arguments only on blog posts of those smarter than me or if my own results would validate my credibility. In short, I just never got around to thinking through the details of how to determine my actual performance on my rental real estate. This is where my good friend Juan of Finance Clever came in to hopefully save the day – or lead me to put an asterisk next to every conversation I ever had advocating rental real estate. Selfishly, I wanted to know my rental real estate performance over the last seven years without having to personally execute all of the complicated and impressive computation. And I thought a benefit to Juan’s audience would be the examination of a real life case study using real life numbers in a real life context. 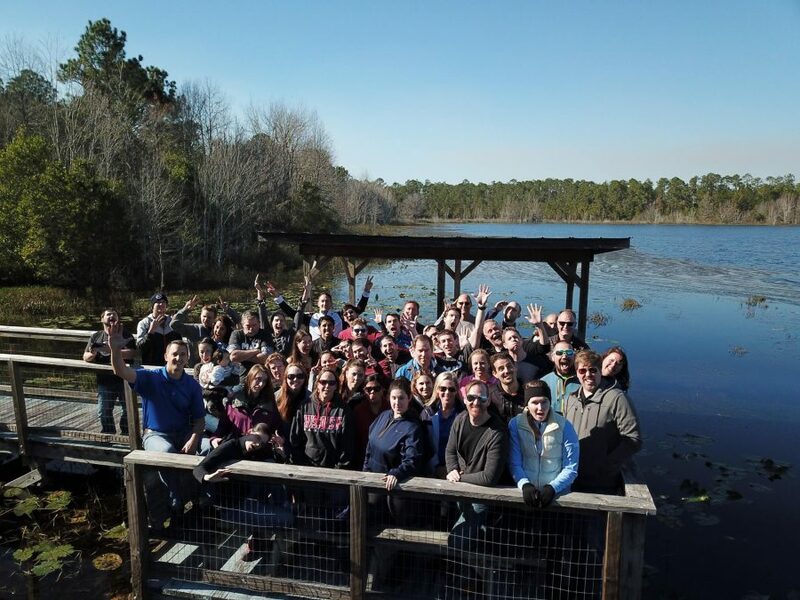 David, yours truly, and many other FI enthusiasts having a great time at Camp FI Southeast 2018. As David mentioned above, calculating rates of return for rental real estate can be daunting. Luckily, about a year ago, I read a book called What Every Real Estate Investor Needs to Know About Cash Flow… And 36 Other Key Financial Measures by Frank Gallinelli. I also took a real estate class while I was getting my Master’s of Accounting program. So when David got in touch with me about this project, I was excited to put my knowledge to the test! Cash Flow: this is what the investor gets to keep after subtracting all expenses from the rents collected. As its name suggest, cash flow is a measure of the cash that comes in (actual rents paid by tenants) vs the cash that goes out (mortgage payments, repairs & maintenance, property management fees, and many other expenses landlords can encounter). Mortgage Principal Payoff: traditional mortgage payments are made up of four components: principal, interest, taxes, insurance (PITI). The last 3 (ITI) are true expenses, once they leave your bank account, you will never see them again. However, the principal portion (P) of your mortgage payment becomes part of your equity in the property. As you recall from the definition of cash flow above, your ENTIRE mortgage payment reduces your cash flow. What we are trying to do here in terms of calculating total return is accounting for the fact the principal portion of your mortgage payment builds equity. As such, this wealth building component needs to be included in calculating total returns. Appreciation: in general, real estate prices increase overtime. These price increases can be extraordinary in certain markets (e.g. San Francisco) and certain time periods (e.g. leading up to the 2008 financial crisis). However, over historical long time periods real estate prices are pretty much in line with inflation. As such, I assumed that David’s properties appreciated at an annual rate of 2.5%, roughly in line with inflation for the last decade or so. Tax Shield: the U.S. tax code is known to be generous with real estate investors. Here we are referring to the fact that you can depreciate rental properties. The IRS uses depreciation to acknowledge that an asset wears down over time. Unlike other real estate expenses, depreciation is a paper loss. This means you don’t spend any money. In other words, your cash flow isn’t impacted, and yet you still get to write off depreciation in your tax return, which can lead to actual cash savings on your income taxes. Because depreciation can be a substantial “expense” rental properties can have a taxable loss, even though they might have positive cash flow. Whether this will ultimately give you a tax benefit depends on your adjusted gross income (AGI). Covering the passive loss imitation rules in detail could take an entire article. For now you just need to know two things. First, if your AGI is above certain thresholds, your rental real estate losses will not be allowed and therefore, you will not get any “tax shield” in the current year. Second, David has been under the AGI threshold so he has actually received tax shield benefits from some of his properties in certain years. Go David! Now that we understand all of the pieces that drive return, let’s dive into the numbers. The table above summarizes our four key metrics per property for each year David has owned them. Here are some important notes on each property. Property #1: this was David’s first property and the only in which he currently has a mortgage (you can tell because it is the only property that has a “mortgage principal pay down” component). To properly account for the mortgage, I collected the loan information from David (loan term, interest rate, initial balance, etc.) and built an amortization table to know the breakdown between interest (an expense that reduces cash flow), and principal repayment (also reduces cash flow, but builds equity so the principal portion makes into the “mortgage principal pay down”). Property #2: this property had a mortgage for some of the years included in this analysis. David paid off the mortgage aggressively and now owns this property outright. Since the aggressive pay down of the mortgage would make the calculation very cumbersome, and David does not have detailed records, we decided to assume this property was owned outright (no mortgage) from the beginning. This is a conservative assumption. If we were to account for the mortgage, the overall returns on this property would likely be higher. Before we get too excited about having mortgages on rental properties, consider this. In good times (good economy, low interest rates) having a mortgage on a property can increase the overall return on investment. However, be aware that leverage works both ways. In bad times (property values declining, higher vacancies) having a mortgage can turn small losses into big losses. Not to mention the risk of defaulting on your loan and losing your property altogether. David has made it a point to own his properties outright. He has acquired most of them in cash and aggressively pay down mortgages. This is line with the goals he outlined in the introduction (strong cash flow for financial independence). Properties #3-6: David owns all of these properties outright. This leads to strong cash flow (no mortgage payments), and reduced risk. Since David doesn’t have to make mortgage payments every month, he could weather an economic downturn much better than investors who are highly leveraged. Now that we have some context on the properties, let’s dive into the calculation of return on investment. ROI measures the gain or loss generated on an investment relative to the amount of money invested. ROI is usually expressed as a percentage and is typically used to evaluate financial decisions and to compare the efficiency of different investments. We already have the four key drivers of return for each property from the first big table. All we need now is to aggregate them and compare them to the amounts of money David invested initially. See table below. The first big negative numbers from the bottom up are David’s initial cash outflows (AKA his initial investment). This includes the down payment on the properties plus any closing costs David was responsible for paying at closing. 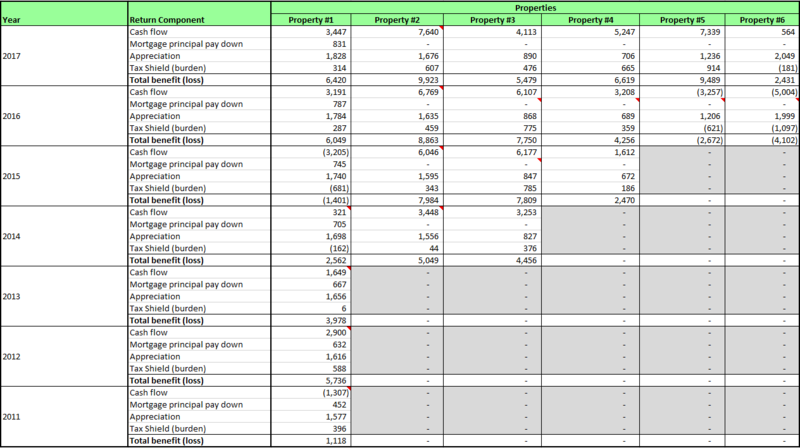 With this information we can now calculate the ROI for all properties and years. See below. The table above shows the simple ROI by dividing each number into the initial investment. This is called simple or undiscounted ROI because it does not take the time value of money into consideration. If you invested $10,000 in 2010 and that investment has returned $1,000 every year, your simple ROI has been 10% (1,000/10,000) each and every year. Inflation: in 2011 $1,000 would buy you more goods and services than $1,000 would buy you in 2018. Intuitively, your ROI should be higher in 2011 than in 2018. Opportunity cost: you could have taken the $1,000 you received in 2011 and re-invested it. By 2018, those $1,000 you invested would have grown into $1,500 (assumed for this example). $1,500 is greater than $1,000. Just another way to show that the receiving $1,000 in 2011 is more valuable than receiving $1,000 in 2018. To account for the time value of money, we need to use a discounted ROI. Discounted ROI is just a fancy way of saying that you need to account for the time value of money. If you don’t, your returns will be overstated, especially those further into the future. Now that we have the context, I present you the discounted rate of return for David’s properties. As you can see, these return are a little lower than the undiscounted ones from the previous table. Again, this is because we are discounting future returns back to the present to account for the time value of money. So, what discount rate should we use to discount returns back to the present? Selecting an appropriate discount rate: at this point we start getting a little into the art of finance. While everyone can agree on what the present value and future value formulas look like, everyone seems to have a different opinion on what the appropriate discount rate is. For big company’s evaluating projects, textbooks would point you to use the weighted average cost of capital (WACC), which is basically the company’s cost of raising money, commonly through a mix of debt and equity. In David’s case I decided to use 5.5% as the discount rate. The mortgage that David holds on property #1 has an interest rate of 5.5%, so this should be good enough proxy for David’s cost of capital. Note that the higher the discount rate, the more your future returns will be diminished. Makes sense, since the higher your opportunity cost, the more you’d be interested in getting your money back as soon as possible. On this final ROI table we can see how David’s performance has generally trended up overtime. This makes sense, as you become a more seasoned investor and landlord, you learn and you improve your processes. Just to name a few, you will get better at finding and buying better properties, you will get better at advertising your properties so that you find better tenants and reduce your vacancies, and so on. In summary, investing in rental properties is a long-term endeavor. Be willing to constantly learn, improve your processes as you go, and you should see your returns improve over time. To assess David’s performance as a real estate investor, we should look the whole reason why he got into real estate to begin with. I. What are David’s objectives? How has he performed in achieving these objectives? As you might recall from the intro, David is looking for three things. 1) to have steady cash flow from his rental properties for when he transitions into financial independence. 2) Risk mitigation in the form of paid off properties. Note that having paid off properties should also lead to strong cash flow. 3) Diversification in the form of owning different assets classes (financial securities through his retirement accounts, a military pension, and real estate). I think David is doing pretty good in all three objectives. In 2017, David had a net cash flow of $28,350. This alone can support a good lifestyle in many places in the U.S., and even more in other countries where the cost of living is low. Given the very large amount of equity David has in his real estate portfolio, I think he is doing a great job at mitigating risk, and should be able to weather an economic downturn pretty well. Last but not least, David seems to be well diversified between his retirement accounts, real estate holdings, and military pension. In short, David is doing really well at meeting his objectives. I can see a very successful FI future for him. While David might have not kept a super close watch on his numbers from the beginning, he has had a good ballpark idea of where he stands, and his performance shows that. He is a smart and thoughtful guy, so don’t mistake his laid-back attitude in the intro for dumb luck. In my opinion, his success is due to disciplined savings and investing, constant learning, and a good sense for spotting good rental properties. If you are an aspiring or a novice real estate investor, don’t be intimated by the fact that calculating a detailed discounted ROI can be complex, or that the tax code is complex. As long as you have a good grasp of the fundamentals and can see the big picture, you can figure out the details as you go and be successful. I hope David’s case study has proven valuable to you. As someone who is interested in investing in real estate, it sure has been valuable to me. I want to thank David again for letting me and you take a detailed look at his real estate portfolio. I sure was nervous about sending you all of that information but knew I had to face the music sooner or later. What if it turned out I was a fraud! Glad it didn’t turn out that way and I can still hold my head high. Thanks for explaining the terms and providing a practical perspective. You have a knack for that. Enjoy FinCon18! Thanks, David! From our previous conversations regarding real estate, I had a feeling your returns would be good. It’s hard to go wrong with the great price-to-rent ratios you have. Great case study! I’m still wrapping my head around all of the math. Any chance you can make the spreadsheets you used available for download? I assume it took a lot of time to create them so I understand if you want to keep them private. Thanks for stopping by, Phill311! I have thought about making it available for download. Before I do that, though, I need to make it more user friendly, it probably won’t be very helpful in its current form. Excellent job and explanation, Juan. I’ve “met” David online, and it’s interesting to see the real world real estate numbers for his portfolio. I also like to use an IRR calculation to get a similar result. I think you might’ve done something like that when you discounted the future cash flows. A lot of real estate investing professionals use IRR (or it’s cousin MIRR). I’ve traditionally used an IRR, but I like the MIRR a little better because it accounts for the fact that your reinvestment of rental cash flows may not be at the same (higher) rate. I did consider adding the IRR to the analysis but ended up leaving out as most of David’s properties don’t have a long enough history. Also, the lack of a large positive cash flow at the end (e.g. upon sale of property) made the IRR negative for all but property #1.